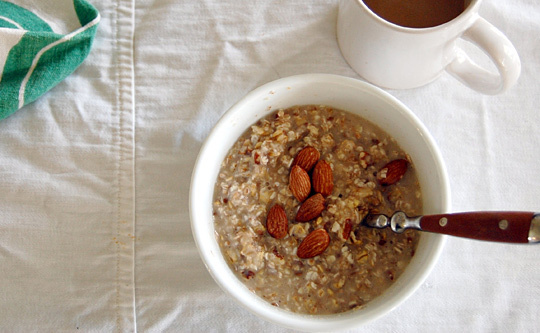 Oatmeal is the breakfast of champions this time of year. We also love it in pancakes, muffins, cookies, scones, and bread. Anything that can be passed off as breakfast, really. But we’re always a little confused when a recipe calls for one particular kind of oats, be it quick-cooking or old-fashioned. And can we substitute one for another? All oats great and small start off life as an oat groat. A groat is simply the whole unbroken grain of oat. Before being made into any other variety of oat, groats are usually roasted as a very low temperature. This not only gives the oats their nice toasty flavor, but the heat inactivates the enzyme that causes oats to go rancid. This makes oats more shelf-stable. As a final note, Harold McGee in On Food and Cooking says that all processed oats have the same nutritional value. This was a surprise to us. We assumed that the more processed the oat, the less nutrition would remain. We’re happy to be proven wrong this time! What kind of oat do you like best?